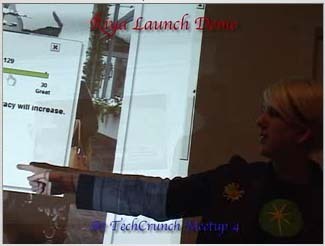 Tara Hunt, Online Marketing Manager for Riya, demonstrates their photo face and text recognition features at TechCrunch Meetup #4. Riya is in alpha, but has already received positive responses from reviewers and a certain buzz. There were over 250 that came to Michael's house for the Riya launch party. You can hear their activity in the background. I did some filtering to pull out Tara's voice. I videod other guests which I'll edit and put up in the coming days.